Enjoy a few sunny days without stress, and experience pure nature. Our apartment is large and has a nice ambient, so that you can relax. It is lovely arranged and full of charm. It has a central but still very quiet location. A private parking place is available. In the summer, it is an ideal starting point for numerous sport activities in a wonderful, mountainous landscape. If you don’t want to practice sport then you can just enjoy the peace, or pamper yourself with delicacies and go for the cultural attractions. In the winter, you can reach the well prepared cross country skiing tours within a short walk. You can also easily approach the winter paths and the sled slope, all of which you can use if your winter pass. Even the skiers, the snowboarders and the carvers will find our place very attractive. In the close vicinity, you can find sunny skiing regions with various possibilities, in a mountainous area with a lot of snow. We would be happy to advise you on location. County Selkingen, Biel and Ritzingen: Experience the 3 small, charming villages, with the sun burned barns and houses. The cpunty is in the middle of the vacation region Goms, and it is perfectly integrated in a wonderful landscape. In just a few minutes, you can reach the infrastructures by car or by train. Discover and enjoy the untouched nature or the numerous cultural and historical treasures. Just come and visit us, and let yourself surprised. Special features: The unique apartment can be rented per telephone, fax or cell phone. In the low and summer season, the apartment can be rented only for 2, 3, 4, 5 or 6 days. In the summer season, the rental rates are 60 Euros per day for 2 people and 66 Euros for 3 - 5 people. In the low season, the rent for 2 people is 50 Euros per day and for 3 - 5 people, it is 60 Euros per day, with all additional costs included. Hiking, biking and trip suggestions: Goms offers you numerous hiking possibilities. The hiking tracks are well marked and arranged. You can walk through floodplain forests, or up in the mountains. For the bikers, there are beautiful routs. If you have time and disposition, you should make a 1-day trip to Zermatt, Saas-, Fee, Montana, or in the neighbouring Italy, to Laggo Maggiore, to the weekly markets in Stresa or Domodossola. We suggest you the hot springs in Leukerbad and Brigerbad, the Binn valley with its numerous mineral springs, and the Aletsch plateau with its big glaciers. The Arven wood is also worth seeing. Make a pass trip by car, motorbike, or by the post car. Different toys and books for children are available. In a separate room, you can store and wax your skiers for free. In front of the house, there is a bench, where you can relax or have a little chat with the owners. It is indeed an excellent place to stay. The surrounding atmosphere, weather and the scenic beauty of the location adds more value to the place. Its a cosy place with very friendly Owner. The place is easy to find though we got lost. It is behind the church as u enter Ritzingen. It is easily accessible by the motorway and then the train from Realp to Oberwald (which takes the passenger car upto 9 people for the cost of 25CHF). If you like to drive through the mountains this is the best place to stay. Even otherwise, train can do it for you. Enjoy a pleasant stay! Wir waren 2 Wochen im September 2018 im Haus Distel.Die Ferienwohnung ist sehr gemütlich, geräumig und sehr gut ausgestattet.Es hat uns an Nichts gefehlt.Die Vermieter sind überaus gastfreundlich und sehr hilfsbereit.Wir haben uns sehr wohlgefühlt und kommen bestimmt wieder. Ideale Ferienwohnung für 5 Personen. Gemütlich und die Ausstattung reichlich. Die Schwester von Frau Walther hat uns sehr freundlich umsorgt und jeden zusätzlichen Wunsch erfüllt. Sehr preiswerte Ferienwohnung und super Standort im Feriengebiet Goms. Es freut mich ,dass alles ok war. Da wir leider unterwegs waren , haben wir meine Schwester gefragt ob für uns als Gastgeber einspringt. Wir schauen immer, dass jemand vor Ort ist wenn wir ausser Haus sind. Dies ist uns wichtig, dass der Gast ein Ansprechpartner hat bei Fragen. Wir waren eine Woche in dieser wunderschönen Gegend. Die Wohnung hatte alles, was man für einen perfekten Urlaub braucht. Dorothea und ihr Mann waren sehr herzliche Gastgeber. Wir haben uns sehr wohl gefühlt und können diese Wohnung nur weiterempfehlen. Herzliche Grüße von Henrik, Ute und Eltern! Nuestro hallazgo de este viaje. Está situado en Ritzingen, cerca de Grafschaft. Alpes en estado puro. El apartamento es amplio, acogedor, tranquilo, perfectamente dotado y maravillosamente situado, ideal para familia. La propietaria, Dorothea, es amable y atenta. Más de una semana, que nos ha sabido a poco: trekkings tranquilos partiendo de la misma puerta de casa, escapadas a Zermatt, al glaciar del Ródano, y al lago Maggiore, Furkapass, Simplonpass y Grimselpass, funicular y trekking desde Bettmeralp hasta el Jungfrau-Aletsch-Bietschhorn. Volveremos, sin duda. Es freut uns immer wieder wenn wir eine tolle Bewertung bekommen. angenehm wie möglich zu gestalten. So weit es geht helfen wir Ihnen auch immer wieder bei den Planungen von Ausflüge oder Wanderungen. Jedes Jahr investieren wir immer wieder etwas in Wohnung, damit sich der Gast bei uns wohlfühlt. Der Aufenthalt im Goms und der Ferienwohnung von Fam. Walther war sehr schön. Das Preis-Leistungsverhältnis ist sehr gut. 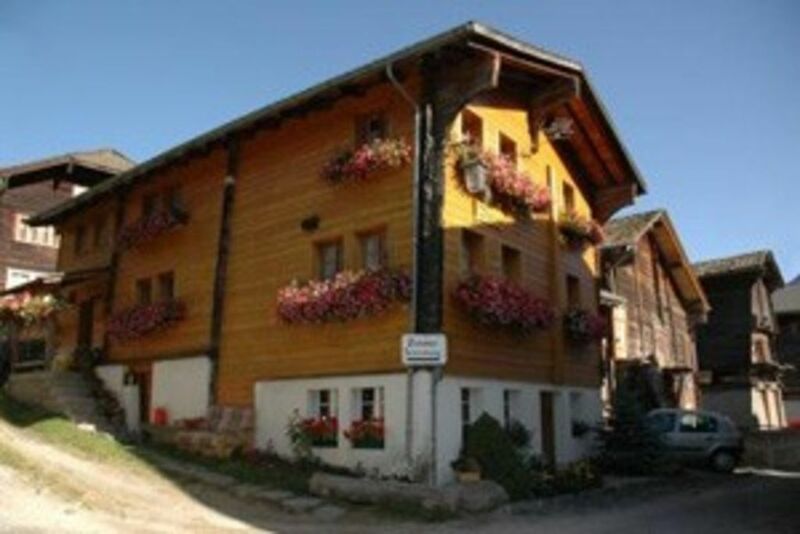 County Ritzingen is a small, idyllic mountain village, on the sunny side of the Gommertal. In the village you will find a post and a transportation office, a hotel and a restaurant, as well as other small stores, where you can go shopping. In the close neighbourhood, you will find further grocery stores, a butcher’s shop, a bakery, banks and different restaurants. In the summer and in the winter you can reach us without problems, via Alpine Passes: Grimsel, Furka and Nufenen, or Loetschberg and Furka. Golf: This is a real paradise for the golfers. You can enjoy your hobby on the 9-hole golf course Soucre du Rhone, surrounded by woods and grassland. Ski: Welcome in the Winter Paradise! In the close neighbourhood, there are fantastic skiing regions with a lot of snow. With your winter pass, you can use 100 km of cross country skiing runs, tens of km of winter hiking trails and well marked North Walking paths, as well as sled slopes. Die Kurtaxe ist im Preis nicht inbegriffen Erwachsene pro Nacht 3.00Euro Im Sommer wird die Heizung bei Bedarf seperat verrechnet pro Woche 70.00 Euro. .